For snorkeling in the Abacos, these two destinations are simply unbeatable! Fowl Cay Preserve is a national underwater sea-park and lies just north of Man-O-War Cay. Your Captain will navigate the short passage through the reef to the main snorkeling area within the sea-park where you can snorkel around several enormous coral heads. There's such a mesmerizing abundance of aquatic life that you'll have to drag yourself back onboard when your snorkeling time is up. Sandy Cay lies within the Pelican Cays sea-park and is yet another unique snorkeling site. Your Captain will be able to provide a tantalizing description of the wall where the reef drops off if you're lucky enough to fit this visit in. 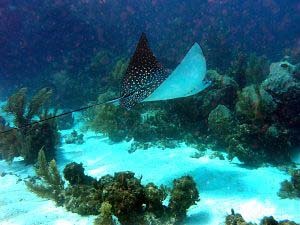 The reef is teeming with marine life and is considered one of the best locations in the Abacos to spot the magnificent Eagle ray!